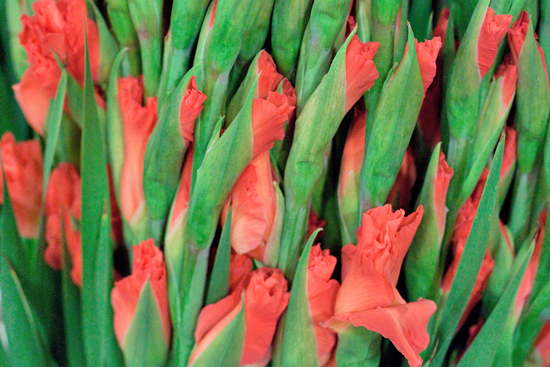 Mention gladioli and what sort of image do they conjure up for you? 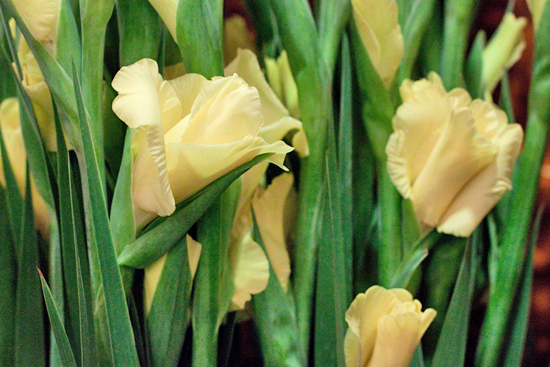 For some people, Dame Edna Everage springs to mind, as 'Gladdies' are her signature flower. Or do you may remember watching Top of the Pops and seeing Morrisey from The Smiths dancing with some stems lodged in his trouser back pocket? In more recent times, perhaps you've seen photos of Rebel Rebel's amazing display of 600 gladioli for a BAFTA After Party? This month, we're going to focus on this budget friendly bloom, which is popular for contracts, events and weddings. There are several different types available at New Covent Garden Flower Market, including of course, Essential White, pictured here. 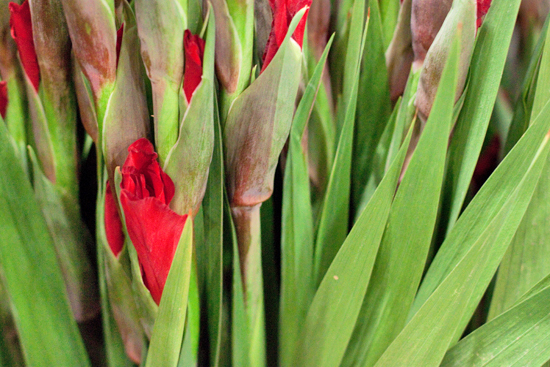 A member of the iris family (Iridaceae), the name gladiolus is derived from the Latin word 'gladius', meaning 'sword'. In fact, the flower is sometimes referred to as the sword lily and in the Language of Flowers, it aptly signifies ready-armed! 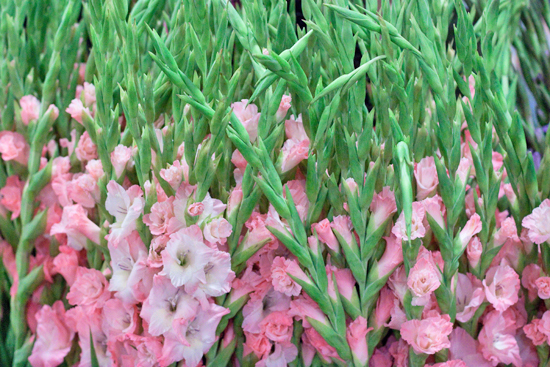 On its long stems, the gladiolus has large funnel-shaped flowers with petals with ruffled edges. You’ll find them in a wide range of colours including white, pink, red, orange, yellow, green and purple. Their peak season is June/July through to October/November and they generally come from Holland and the UK. 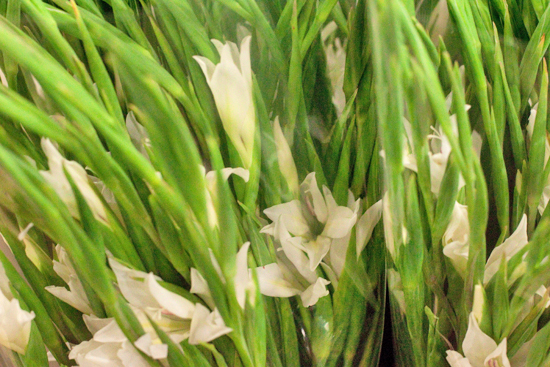 There are two main types of gladiolus at the Market : Standard and Bridal. Essential White are available at several wholesalers including Alagar, D G Wholesale Flowers and Dennis Edwards Flowers. 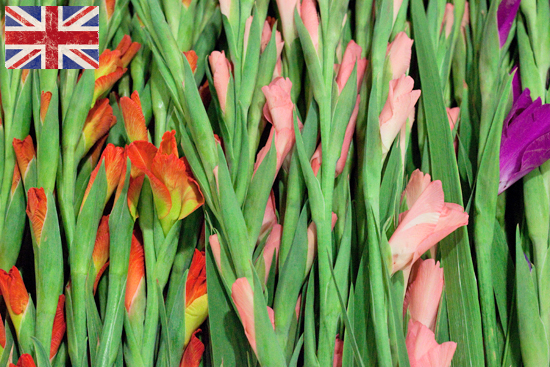 From July through to September, you'll find British gladioli available at Pratley. 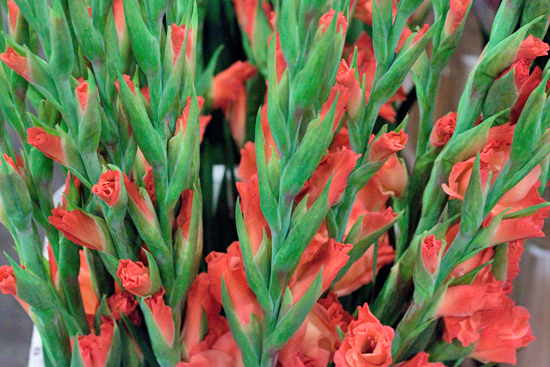 Bridal gladioli have smaller blooms and shorter stems than the standard variety. 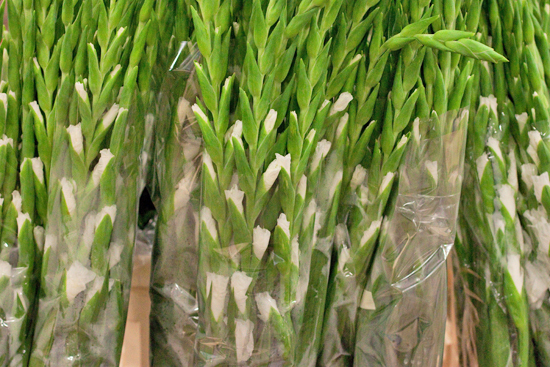 They're sometimes also referred to as mini gladioli and are available at D G Wholesale Flowers. 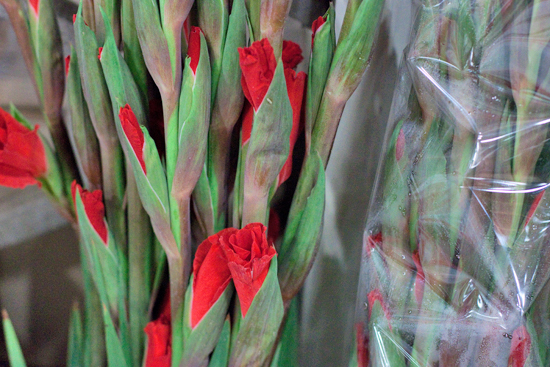 Standard gladioli come in bunches of 10 stems, with bridal gladi coming in bunches of 40 stems. Due to their height, the standard variety is perfect for pedestal designs for weddings and events. They also look stunning massed on their own in a tall cylinder vase. 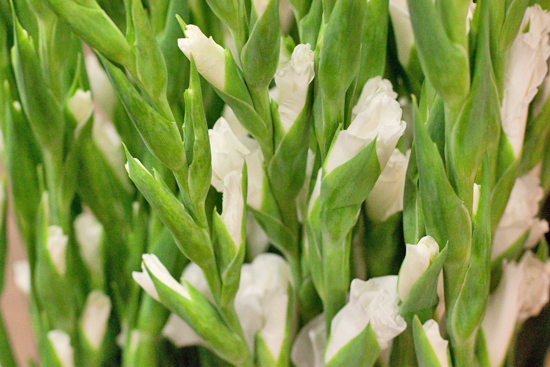 White gladioli are very popular for wedding designs, both the standard and bridal varieties, with the latter being ideal for wired work. 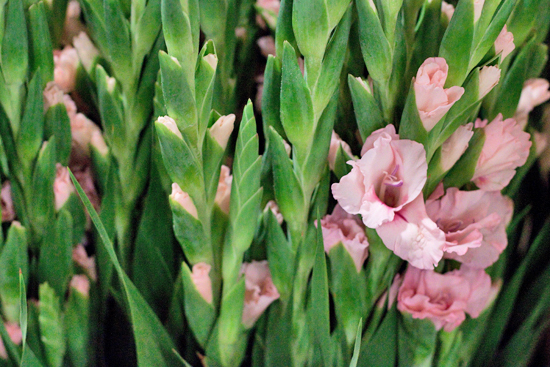 "Gladioli are great for contract work, due to their height. They're a steadfast flower. 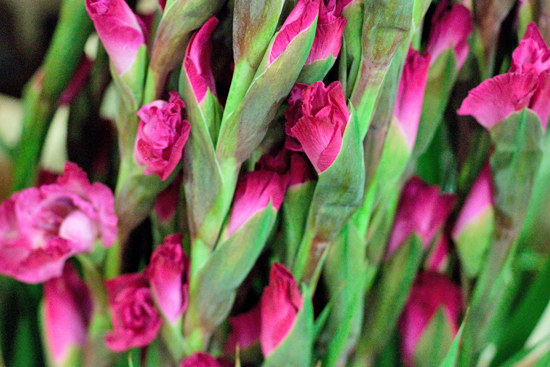 You can get Israeli gladioli, which are available all year round. They tend to be smaller and skinnier though than standard gladioli." To make sure that your gladioli blooms open up in time for a specific event, you usually need to buy them 5-6 days in advance. So, for a wedding on a Saturday, buy them on a Monday or Tuesday. And to encourage the buds to open, simply remove the top bud, either by cutting it off or simply nipping it out. 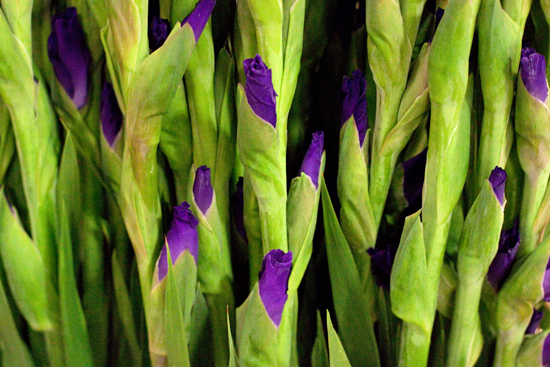 Some of the traders also recommend putting gladioli in warm water once you've cut the stems, to help them bloom. 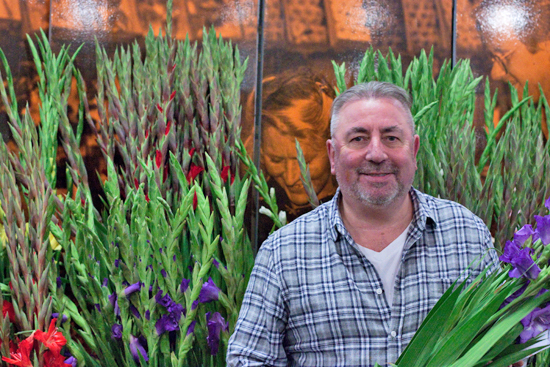 Dennis at Dennis Edwards Flowers has a wide selection of gladioli. 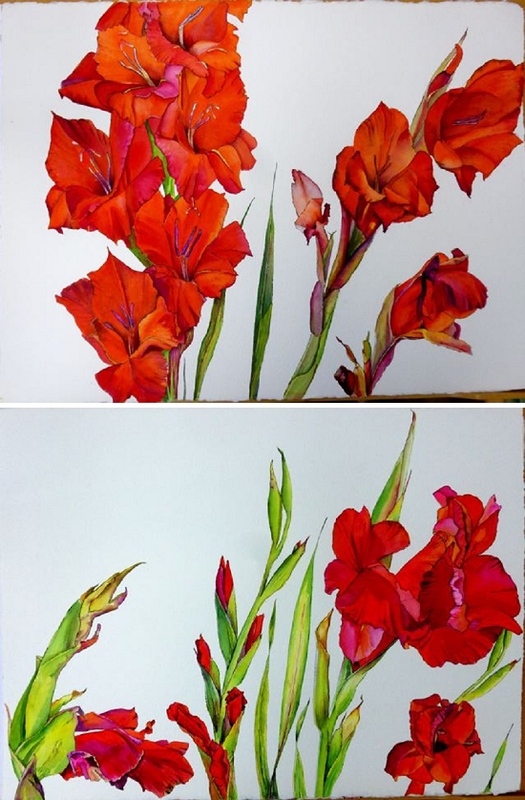 Here are some examples of fabulous floral designs using gladioli by Market customers. 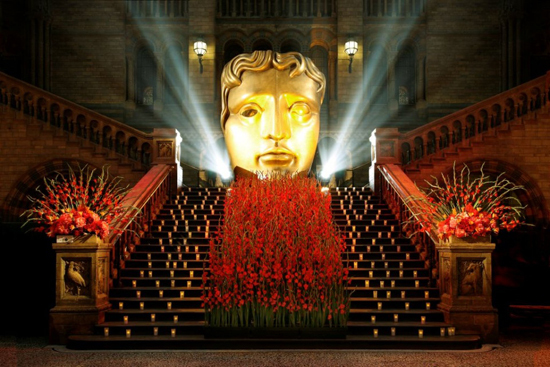 An amazing display of 600 upright gladioli arranged by Rebel Rebel for the BAFTA After Party at the Natural History Museum. 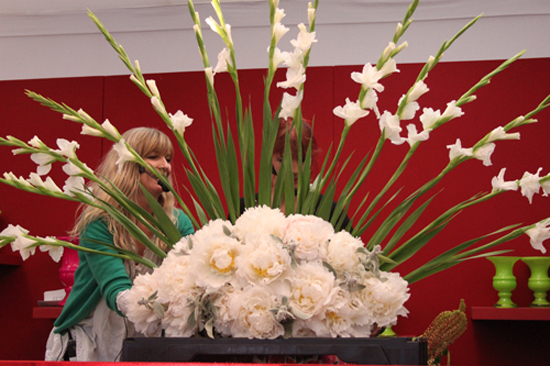 A gladioli fan created by Rebel Rebel in a floristry demo at the RHS Chelsea Flower Show 2011. 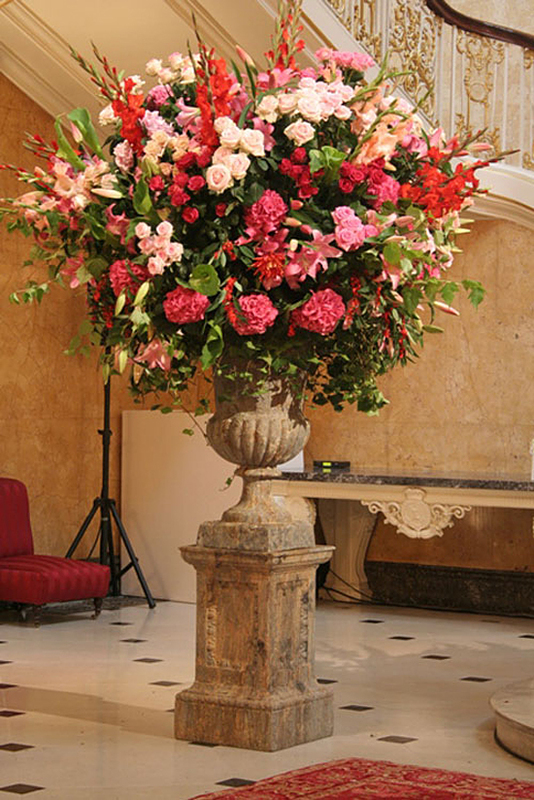 Pedestal design featuring gladioli which was created for a wedding by Simon Lycett. 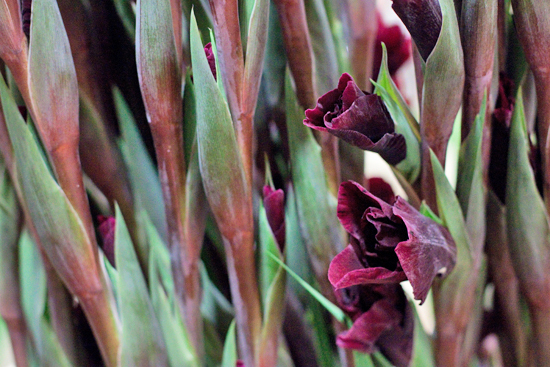 This month, we'd love to see photos of designs you've made using gladioli from New Covent Garden Flower Market. Simply send an email to info@cgma.co.uk, stating your company name and website address. Or if you prefer, you could post your photo on Twitter and copy us in, by including @MarketFlowers in your tweet. We'll then upload your photos into this new section.